A setback at home to Oxford United last week leaves us in a position of needing a positive result in our toughest remaining away game – based on current league positions. The pace and energy of this side that has propelled us into contention for the top six were not enough to breakthrough a resolute Oxford side, however, those qualities are likely to be exactly what could make the difference in this upcoming trip to 2nd-place Barnsley. While there are arguments to be made around resting the likes of Luke Thomas, Tom Bayliss and Dujon Sterling, who were off the boil against Oxford United last week, the is a lack of alternative options – especially of players who can make a real difference – is likely to dictate the trio’s continued inclusions. Of the three, Dujon Sterling – who played from the bench for England under-20s during the week – has the most natural replacement available in Jack Grimmer. However, throwing Grimmer in for such a difficult game having played such little football this season and his eyes surely on a summer move away from the club is hardly ideal. In the cases of Tom Bayliss and Luke Thomas, the most natural replacements look to respectively be David Meyler and Jordan Shipley, both of whom would massively affect the dynamic of the side and slow our play down. Unless there are any injuries that haven’t been made public in the build-up to this game, expect Mark Robins to name the same side as in recent weeks – which is likely to be the case between now and the end of the season. While burn-out is a concern, we have to hope the different context of this game freshens things up. With Barnsley purring following a strong start to the season, few were expecting the Sky Blues to maintain their impressive home form against the Tykes. While Barnsley demonstrated their quality with some impressive build-up play, they struggled to find a breakthrough against an energetic home side who were similarly toothless. With the game winding down towards a creditable point for ourselves, we produced something out-of-character, scoring from a set-piece, with Jordan Willis nodding in a Junior Brown cut-back to secure an impressive three points. The appointment of Daniel Stendel marked a commitment from Barnsley’s new owners to evolve the club under their tenure towards a more continental model, having been one of the smartest recruiters of lower-league talent under the previous regime. It has been evolution rather than revolution under Stendel, with the majority of last year’s squad staying in place and small tweaks being made to make a strong squad an effective team-unit. While Daniel Stendel’s style of football is based on a high-intensity pressing, it has resulted in an imperious defensive record of 20 clean sheets and just 28 goals conceded in their 39 league games thus far. So often, Barnsley have pinned opponents back in their half so far that the possibility of scoring goals becomes a remote possibility, while the attacking interplay from the Tykes can be similarly imposing. Barnsley have had such a cavalcade of attacking talents this season that they have been able to let the likes of Tom Bradshaw, George Moncur and Lloyd Isgrove leave without too many regrets, while Wales international Ryan Hedges struggles to get into the team. For much of the season, the giant Kieffer Moore has been the go-to man up-front, but the forward is out for the rest of the season. For most sides in this division, losing Moore would be season-ending blow, Barnsley though can call upon former Fulham youngster Cauley Woodrow to provide a similar physical presence in the penalty area. 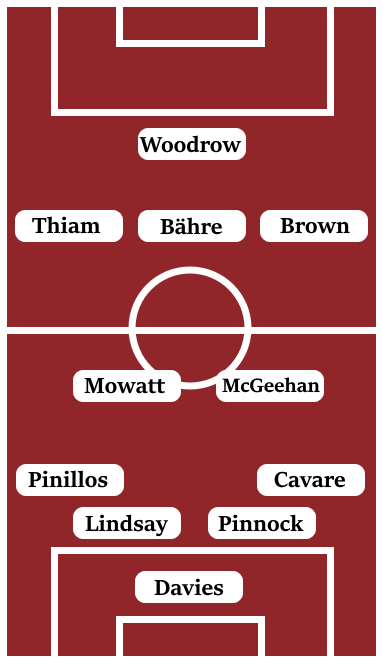 Woodrow is surrounded by pace in the forms of the emerging youngster Jacob Brown, the shot-happy Mamadou Thiam and the impact sub Jordan Green, further bolstered by the overlapping runs of right-back Dimitri Cavaré. Barnsley have suffered another season-ending injury to a key player, in holding midfielder Kenny Dougall. It means that the technically-gifted but attack-minded duo of Alex Mowatt and Cameron McGeehan have had to share defensive responsibilities in a Lampard-Gerrard-esque manner, although McGeehan in particular has shown more discipline than previously given credit for during his time at Luton, where doubts were placed even on his ability to operate in a central midfield two. In defence, Barnsley’s centre-back pairing of Ethan Pinnock and Liam Lindsay wouldn’t be out of place for a Championship side chasing the play-offs. Both are very technically-adept centre-backs with Lindsay more of a physical presence and Pinnock the pacier of the two. Behind them is Adam Davies in goal, recently voted into the League One Team of the Year. The loss of defensive midfielder Kenny Dougall is an undeniable blow to the way Barnsley are set up to play. As a side that likes to take risks in pushing players forward, losing that defensive midfield presence to stop or slow down opposition counter-attacks makes them more vulnerable, as was seen last week against Walsall, where they were lucky to have had two goals against them disallowed. The pace of Amadou Bakayoko, Jordy Hiwula and Luke Thomas should be used as a counter-attacking weapon, while ensuring that Bright Enobakhare receives the ball in the opposing half where he can exploit the space between midfield and defence, rather than in our half where he is likely to be susceptible to Barnsley’s pressing game could be key in deciding the flow of the game. While the nature of this game arguably suits the qualities of this side, we are going to have to be switched on both in our defensive shape and our use of the ball in our own half.